Is Mint Going After Freshbooks? Its New Features Point In That Direction. Personal finance tracking site Mint.com added a bunch of new budgeting and trending features today. 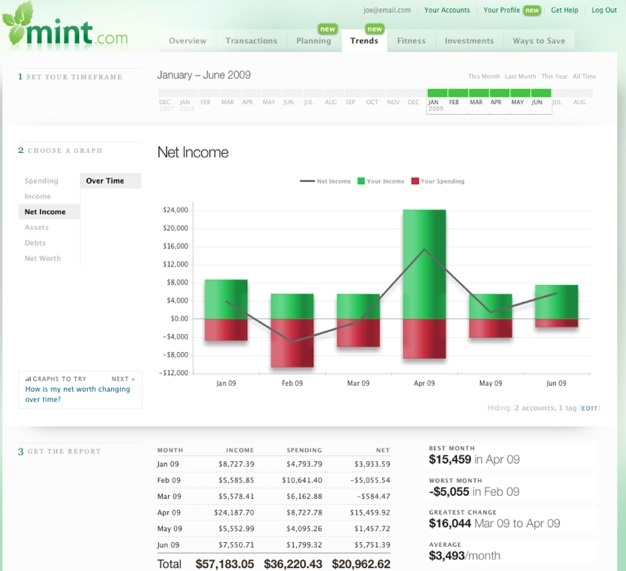 Mint presents consumers with a financial dashboard based on spending and income data from their bank, credit card, and other financial accounts. It expanded its charts to include spending over time, income history, asset allocation, and net worth over time. You can now plan for irregular expenses such as property taxes, auto insurance, or vacations. Budgeted items can be rolled over into the next month if they haven’t been used up, and Mint now figures out your income based on your paycheck. It takes all of this data and projects your savings or shortfall over time. All of these new features will be appreciated by Mint’s 1.4 million registered (and 550,000 active) users, but they also point to a new direction for the site: bookkeeping for small businesses. Mint now has pretty robust reporting for personal expenses, income, and savings. These same tools could very easily be tweaked to help small businesses track costs, revenues, and profits. All Mint needs to do is change the names of the categories, and add an invoicing feature to go after basic accounting sites like FreshBooks or Outright, which are in turn going after Intuit’s more fully-featured QuickBooks. For entrepreneurs with limited time on their hands, the ability to track both personal and business finances in one place would have obvious appeal.